In their desire to preserve the rice terraces, traditional farmers and villagers whose major produce is the native rice called Tinawon held the first “2nawon Festival” in Barangay Anao, Hingyon, Ifugao. Tam-an Banaue Cooperative chief executive Jose Tomas said the three-day festivity is a show of the villagers’ and farmers’ commitment to help in the preservation of their rice terraces. “Together with villagers and native farmers who are the major producers of the Tinawon rice and other traditional rice varieties, we celebrated the first harvest festival for a successful second harvest this year,” Tomas said. 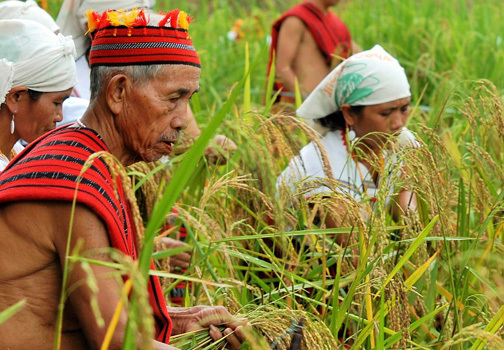 “The idea of celebrating a harvest festival is to give honor to the cultivators of the payo [rice paddies] who contributed to the preservation of the Ifugao culture,” he said. Also a native of Anao village, Tomas said that while planting on the terraces is not economically viable, the Ifugao farmers still continue to grow Tinawon and other traditional rice varieties. “This is our contribution to what Ifugao is known for,” he said. Tomas said Tinawon rice, which is traditionally a once-a-year crop, is also known as heirloom rice because it is produced in the traditional way of farming. “We do not use farm machineries or any equipment or the carabao, and no commercially produced fertilizers are sprayed over the growing rice plants,” he said. While Tinawon rice is grown only once a year in some areas in Ifugao, many among the Ifugao farmers have now started growing it twice a year. “This is one of the reasons why we now have the 2nawon Festival as we can see the possibility of harvesting the Tinawon rice twice a year in rice terraces found in the different mountain areas of Ifugao,” Tomas said. In the rice paddies, the Ifugao farmers also grow the native Dolog fish and the almost extinct Juju fish while waiting for the next harvest season. During the festivity, participants joined the “Hudhud hi botok” contest where they performed the “hudhud” (traditional chant) while harvesting and other activities including the “Haydun di Yuyu” (fish catching), “Binakle” (native cake) making demonstration and native dance contest. During the festival, a seminar on biological farming was conducted with the groundbreaking of the Anao-Burnay road funded by Sen. Cynthia Villar and Rep. Dong Mangudadatu. Meanwhile, Orlando Ravanera, Cooperative Development Authority chairman, said he would bring a delegate from Ifugao to China to learn effective organic farming. “One of the current focus of the agriculture department is on heirloom rice production and the rehabilitation of the damaged tuping [stone walls] to bring back the rice terraces to its former glory,” Ravanera said. He said the government also aims to help the Ifugao farmers learn new methods to boost rice yield and assist in marketing the Tinawon rice and other products to boost the economy of the province. Ifugao farmers can produce woodcarving, weaving and other handicrafts, which are part of the Ifugao’s rich culture.